The International Monetary Fund (IMF) tracks global economic growth in order to better assess the social and economic health of emerging and developed countries. In its latest report released in October, the IMF revised its growth forecasts for both international and U.S. economies. It is expecting that international growth will be marred by Britain’s vote to leave the EU and revised growth prospects for the U.S. The decision by companies operating in Britain to curtail and delay business transactions in the EU may hurt growth of companies dealing in the EU. 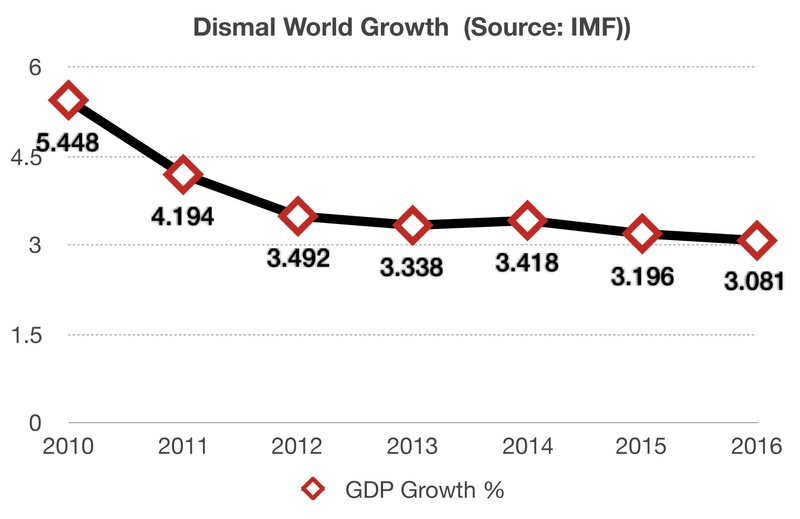 The IMF has revised its global growth forecasts down to 3.1% in 2016, down from 3.2% last year. Of greater concern is the drop for U.S. growth, expected to expand by 1.6% for 2016, down from 2.6% in 2015. The IMF does believe that persistent stagnation in advanced economies could fuel anti-trade sentiment, thus stifling global growth. Stagnation within developed economies could further fuel populist demands for restrictions on trade and immigration. The IMF sees economic growth made up of various components which all contribute to the expansion of countries. Among the various components, government should spend more on education, technology, and infrastructure in order to expand productive capacity while addressing income inequality. A bright spot within the IMF report revealed that emerging and developing economies will accelerate in growth for the first time in six years. The growth rate is projected to be 4.2 % for 2016, increasing to 4.6% in 2017.